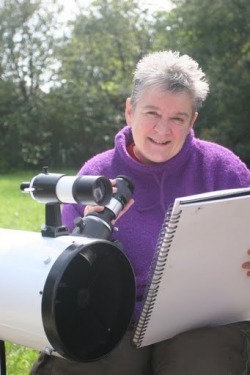 I am an amateur astronomer , an artist and and an educator a combination which is very enjoyable and fulfilling. 2010 to date - I run the only school based astronomy club for young children in Ireland. St Cronans Stargazers Bray Co Wicklow. I run the after school Cro Kids astronomy group at St Cronans National School Bray Co Wicklow. Action Sun – Lets bring the sun to Earth May 27th – 31st 2013 at Lembang, West Java Indonesia. Event is The UNESCO colloquium Building the Scientific Mind 2013 click here to read about it. 2011 OPTICKS an International collaboration of Artists and Scientists, Musicians and Radio Astronomers across several disciplines.Deirdre Kelleghan designed and ran two painting workshops specifically for the project Deadly Moons and The Suns Massive. Children from St Cronans NS Bray and Girl Guides from Stillorgan took part. Focus on Saturn – Orbit Oct/Nov 2004 article about the Saturn Observation Campaign.